One of the biggest trends to hit the world of social media is flat lay photos, especially on the social media platform Instagram. Flat lay photos are a great way to highlight your business’s products or tell a fun story with objects. Best part? Flat lay photos can easily be taken with your smartphone! Flat lay photos are incredibly popular right now, for good reason! They resonate well with fans and are extremely easy to set up and shoot. In this blog, we’ll cover our top tips for styling flat lay photos on Instagram. What is a flat lay photo? First of all, if you find yourself asking “‘What is a flat lay photo?”’ you’re in the right place. Simply put, a flat lay is a photo of objects lying flat on a surface or table, shot from directly above with the camera nearly parallel to the surface. 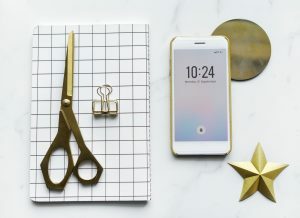 Flat lay photos are incredibly popular on social media channels like Instagram and are a great way to display products and items, or share a message. If you haven’t used a flat lay photo yet, you’re missing out! Pick a Color Theme: All of the objects in your photo should have some sort of theme and all fall within a specific color spectrum to ensure the continuity of the photo. Notice how the gold color pops in the image above and how each object has a least some gold on it. Experiment with the objects you choose to include in your photo and find pieces that complement each other and carry the theme throughout. Mind Your Background: Flat lay photos are best shot on light or white backgrounds to allow the objects in your shot to pop. Find a background that will not take away from the overall image or be too distracting. Style Your Objects: As you set up your photo, try different layouts of your objects and make sure to mind the negative space – or the places within the photo with nothing in them. Leave room for text if you are planning to go back and add in words later. Take a few shots and check them to see what needs to be moved or re-positioned. Try a few different styles to see what works the best. Check Your Light: As with any photography, the best flat lay photos are those that are bright and properly lit. As you plan to take your photo, be sure the shot will be well lit, but not too overdone. Stay on Brand: Flat lay photos are a great way for your business to carry your brand and voice by composing shots that are within your color scheme, represent your products and services, and have the “voice” of your company – or how you represent your business. If you’re adding text to your flat lay photos after you take the shot, be sure to use your company fonts and follow your style guide. 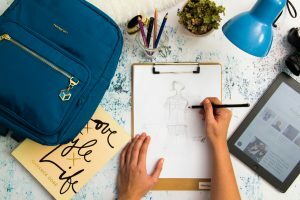 While flat lay photos are fun to style and shoot, don’t get too far away from your brand standards. Ready to learn more about how you can use your smartphone to take amazing shots for your business? Check out our Smartphone Photography for Beginners class offered at Digital Workshop Center. In this class, you’ll learn important skills, such as how to operate a smartphone camera, compose quality images for a wide range of photographic situations, and how to best leverage these photos in your digital marketing. Click here to learn more about the class and register.